Again, it was a Saturday afternoon for the First Team with little to report, losing to the same score line as last weekend, 5-0. Harrison Signs had a 3-0 HT lead, and with Cliffe reduced to 10-men after Tom Grundy was shown red for a retaliation to a reckless challenge, mountain to climb for Cliffe once again. 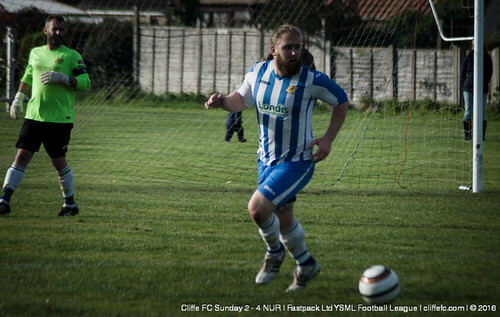 Cliffe did improve after being a man down, but the extra man took its toll as Signs scored twice more for 5-0. Harrison Signs finished with 10-men also after one of their subs raised their hands to Callum Ransome’s face, 5-0 FT. Ally Harris was named MOTM for a number of super saves once more, but again youngster Matty Holmes was the most impressive outfield player in a Cliffe shirt. 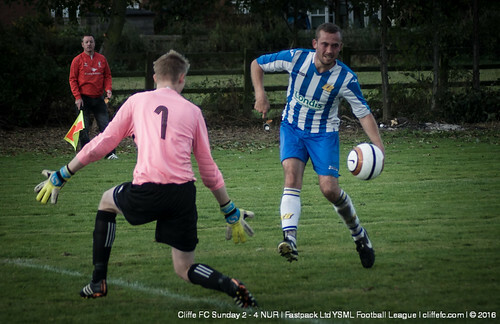 Next Saturday is a must win game for Cliffe FC, as the bottom two in Division 1 face off – Cliffe FC vs. Heslington. Cliffe FC Reserves responded well from their drubbing last week, a 4-2 home defeat was the result – Cliffe unlucky to lose, a couple silly mistakes and Cliffe rueing missed chances themselves. Cliffe goals came from and own goal, and Glynn Richardson following up a saved penalty kick. MOTM was Liam Tomlinson. Again, some good football played by Cliffe’s young Reserves side, and hopefully the result will follow soon. Next week it’s Poppleton United away. A much improved performance from the Cliffe Sunday side, and as per the Reserves, it was a case of rueing missed chances when on top that ultimately saw the result swing the way of the away side. Cliffe could have been 4 or 5 goals ahead before the first goal of the game went the way of NUR, Andy Edwards denied a few times, and Callum Ransome hitting the woodwork before NUR worked an opening and scored from close range, 0-1. Man-of-the-match Kev Taylor forced the equaliser before HT, dribbling past a number of player before his fired-in cross was converted by an NUR defender for an OG, 1-1 HT. NUR went ahead once more from a sweetly hit freekick before Nathan Parker equalised for Cliffe. But as Cliffe looked to get ahead, as Tom Collins had a goal disallowed for offside, however a penalty kick was given to NUR and scored for 2-3, and late on NUR scored their forth squeezing a shot in at the near post for 2-4 FT.
Next Sunday it’s FA Cup competition, and fellow Selby club, Hounds FC are the opponents.